Stena Line and Mercy Ships were awarded “Company collaboration of the year” at the charity event Insamlingsforum 2018 in Stockholm on 24 April. The motivation highlights both the recent fundraising coffee campaign onboard and the Stena Line volunteer program and call the partnership a forerunner within company collaborations. "The partnership with Mercy Ships enables us to make a difference and take a greater social responsibility in a way we have never been able to do before. I proudly share this award with Mercy Ships and all Stena Line employees and customers that contributed during the coffee campaign", says Niclas Mårtensson, CEO Stena Line. The partnership goes beyond classic fundraising campaigns and involves both customers and employees to raise awareness and funds to support the work of Mercy Ships. 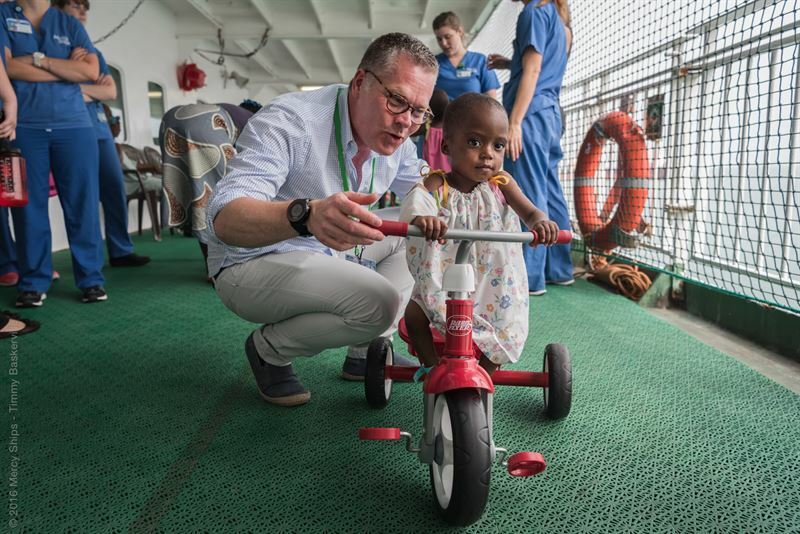 The volunteer program also makes it possible for Stena Lines skilled employees to contribute with specific competence to the Mercy Ships operation onboard the hospital ship Africa Mercy. This close industrial partnership is a forerunner within company collaborations. The coffee campaign was launched on all Stena Line ferries during September and October 2017. The customers were given the opportunity to choose to buy their coffee or tea in a special Mercy Ships mug where 20p was donated directly to Mercy Ships. In total 61 807 donations was made by the customers during the campaign period, which is equivalent to keeping an operating room running for two weeks on board the hospital ship Africa Mercy. The humanitarian NGO Mercy Ships and Stena Line went into partnership formally in February 2017 with the aim to raise general awareness about the charity, promote volunteering and charitable giving both within Stena Line itself as well as amongst its customers and partners. Stena Line is one of the world's largest ferry operators with 38 ferries and 21 routes in northern Europe. Stena Line is developing new intermodal freight solutions by combining transport by rail, road and sea and it is an important part of the European logistics network. The company is family-owned, was founded 1962 and the head office is located in Gothenburg.